To celebrate the LIBERTY Art Fabrics & Fashion exhibition, Dovecot Studios has collaborated with Historic Environment Scotland and the SCRAN and Canmore online archives to bring together a collection of historic images of Scottish department stores from across the decades. 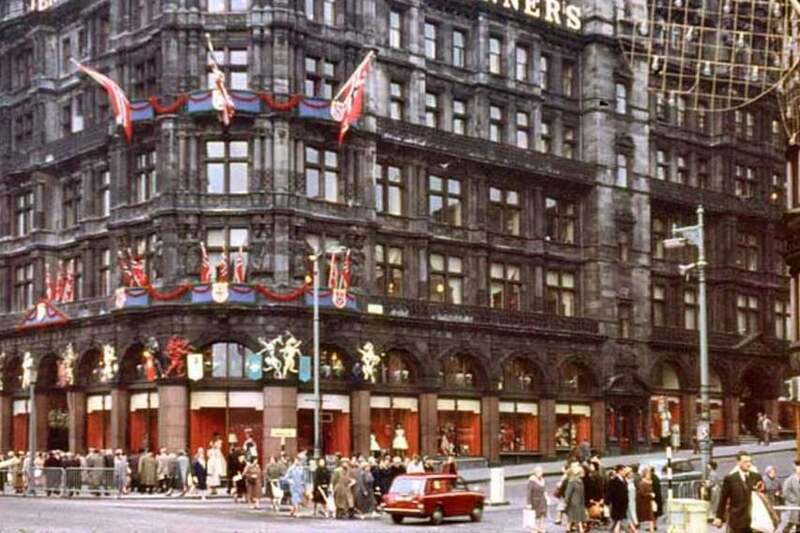 Scotland’s association with the pinnacle of department store shopping has a long history dating back over 180 years to when Charles Jenner founded his store on Edinburgh’s Princes Street in 1838. From Jenner’s to fondly remembered names like Binns and Benzies – this exhibition is a stroll down the Scottish high streets of the past. Many of the stores in this exhibition are still in operation – others have buildings that remain as a hint to the past but which now have different uses. In other images the architectural scene has changed beyond recognition and it is from a few visual clues that the hints of today’s high-street can be found. With the nature of shopping changing once again the department stores are back in the headlines and fighting for survival as a nation’s shopping habits change. This exhibition shows how department stores have continued to reinvent themselves, and how, through these iconic stores Scotland’s cities produced some of the finest examples of forward thinking architecture and iconic design, housing household names like Marks & Spencer and John Lewis. More than simply a place to purchase high fashion and household wares the department store was a place to meet, to see and be seen, the destination for a day out, a trip into the big city, a meeting place to be pampered and indulged. Department stores provided a complete experience such that the memory of a favourite store will often hold a firm place in a cities heart long after they have closed. The exhibition runs from 12 October in the weaving floor viewing balcony. For more information, please visit the website. To enquire about hosting an event at Dovecot Studios, use the enquiry form or the venue page.